The Dreyfuss Hudson is one of the most impressive-looking streamlined locomotives ever made. New York Central created the first streamlined steam locomotive with the Commodore Vanderbilt in 1934. In 1938, the Central's third streamlining effort was unveiled. Ten J-3a Super Hudsons were shrouded for service pulling matching streamlined cars on the 20th Century Limited. These trains were designed by Henry Dreyfuss, the famous industrial designer. In the late thirties, before America's involvement in World War II, the art deco movement was a symbol of modern progress at the heels of the Great Depression. The streamlined 20th Century Limited still looks like a futuristic icon, and the New York Central was not sparing any expense promoting themselves as a modern railroad. There have been a lot of different O gauge models over the years of the Dreyfuss 20th Century Hudson. They ranged from the Lionel 221 toy locomotive to the scale brass Max Gray import to the Marx Trains tinplate model. Plus Williams, 3rd Rail, Weaver Models, Lionel and MTH have already produced various models of the locomotive. They were all brass, except the MTH version. It was made in diecast for the RailKing line. 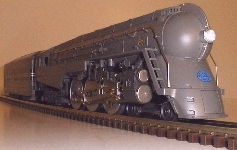 Until the MTH scale model of the Dreyfuss Hudson was delivered in December of 2000, O scale Dreyfuss Hudsons were made of brass. MTH's model is diecast, which is more sturdy than brass and what the O gauge hobby is used to. The catalog depictions announcing the production of the Dreyfuss Hudson showed the model as having black cylinder heads and a black logo shield on the front skirt. This would not have been accurate. The production model has polished cylinder heads and blue NYC logo on the skirt. This is correct. Overall, the MTH Dreyfuss Hudson looks good. It has a lot of applied details and is a solid, sturdy piece. Some have wondered if the shade of gray isn't too light. This is a difficult argument because the real Dreyfuss Hudsons had been repainted over the years during their service from 1938 to the late 1940s. The handrails are painted gray as well. Every picture I have seen suggests the handrails were not painted. The MTH model has Boxpok drivers. Some of the Dreyfuss Hudsons were built with these type, and the others had Scullen Disc drivers. The striking inaccuracy concerning the drivers is that the tires are blackened. What happened is that MTH, in an effort to make the hi-rail steam locomotives look more realistic, directed their supplier to blacken the tires of the drivers. Black drivers with shiny nickel tires looked too toyish. What the supplier did not know was to leave the Dreyfuss tires alone, so the reverse effect happened. MTH dulls their drive rods so they look a bit weathered. Like MTH's Empire State Express Hudson made five years before, the drivers of this Hudson are illuminated. Whether or not this is accurate is uncertain. But they do look good, particularly with the house lights off. There is also the headlight, tender back-up light, cab interior light, and firebox glow. The tender decoration has two problems. First, the stripes are supposed to wrap around the front corners of the shroud. On the MTH model, they stop at the handrails. Second, the New York Central lettering is not evenly spaced. The letters "A" and "L" of Central are placed further from the other letters. The pilot has a scale coupler that swings out from behind the streamlined panel. The drawbar has two holes for mounting to the tender. For display, the second hole is supposed to be used. For operation, use the first hole. This is tricky to attach and MTH issued a recall to fix the problem. At the top of the steps near the boiler front, there is supposed to be open space. On MTH's model this area is filled in. On the Lionel model, the area is open. MTH produced seven matching passenger cars for the Dreyfuss. Both a five-car set and a two-car add-on set were released at the same time. The stripes all match between the cars and the tender. Unfortunately, the cars do not have the skirting along the bottom. You can see in the picture above where the tender has skirting. On the prototype, this continued for the entire consist. MTH has matching passenger cars, and Lionel has not produced any yet. This is one of the first locomotives equipped with MTH's forth-coming DCS control system. The instructions note that DCS functions will be covered in the operation manual that will be included with the system. The instructions that come with the locomotive detail conventional operating procedures. Unfortunately, without the availability of the DCS system at the time of writing, it is not possible to run the locomotive to its full operating potential. But it does run very well in conventional mode. When you throttle up, the locomotive starts out slowly and smoothly gets up to speed. Nice and easy. This is more desirable than the way the Lionel model starts out in conventional mode. The smoke unit produces a lot more smoke than the Lionel version. In neutral, the smoke pours out as MTH locomotives normally do. In operation, the smoke pours out in large puffs synched with the chuffing sound. One of MTH's best sounds was the whistle for the Southern Pacific Daylight GS-4. It was crisp, it had power, it sounded realistic. The sound quality of the whistle for their New York Central Dreyfuss is just as good. Clearly, when the announcement of ProtoSounds 2.0 was made, this is the kind of new and improved sounds they were talking about. When DCS comes out, a "Doppler effect" can be activated for the whistle. The Doppler effect is the instant change in audio pitch of an object as it passes you. You hear it on things like planes and train whistles. The chugging is also much deeper than previous MTH locomotives. It definately competes with Lionel's sounds. The station announcement sounds and other features are primed differently than locomotives with the first ProtoSounds. Originally, with the locomotive in neutral, you used to have to set the power low, hold down the bell button until you heard a "whoosh" sound (like air brakes releasing) or a whistle, and then the station sounds were primed. Now, you do not have to be in neutral. Both the whistle and bell buttons are used to prime various effects. For instance, for the station announcements, you tap the bell button once and the whistle button twice. Now this feature is primed. 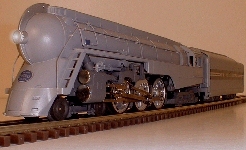 The Lionel Smithsonian Collection model of the Dreyfuss Hudson is still one of the most detailed O scale locomotives ever produced. It was made of brass, and many Lionel collectors who purchased one were not prepared for the delicate model they received. Many of these models subsequently wound up with dents and small details broken off. Lionel announced in their latest catalog from August that they were producing a diecast Dreyfuss Hudson. It was delivered at the end of October. Lionel already had a production sample of it in July, and they used the Smithsonian version to model certain aspects of it. 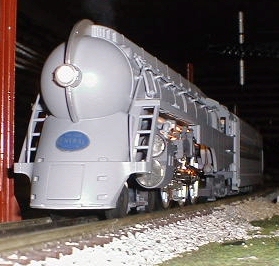 The Lionel model looks a lot like the Smithsonian model. The Scullen Disc drivers look good, but because they are secured to the axles with black screws, they each look like they have a hole in the center. 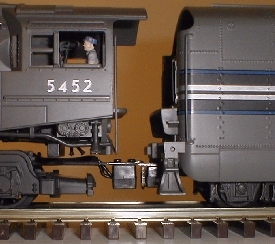 Lionel also dulls their drivers, but they're not dirty-looking like on the MTH model. The valve turn keys are all painted red, as we have seen on other Lionel scale models of late. 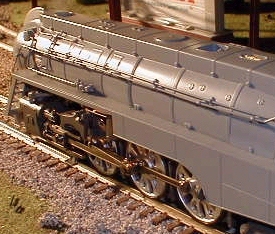 The Lionel model has one less separately-applied pipe detail than the MTH model. Lionel merely cast this pipe in with the boiler. The decoration looks good, and is accurate in the areas where I mentioned MTH's version fell short. 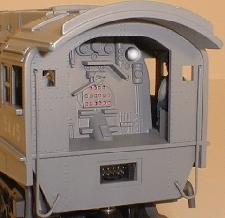 However, in all of the pictures I have seen of the Dreyfuss, I do not believe the cab numbers were outlined in black. They are on Lionel's model. 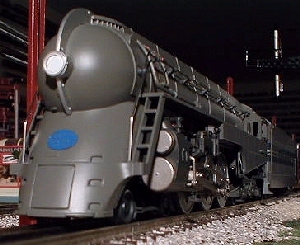 Like the MTH model, the Lionel model has illuminated drivers. Lionel calls them worklights, and it is reasonable to assume that the locomotives had lights for crews to service the engines in darkness. My question is whether or not NYC ran the locomotives with them on. I have never heard recollections that they did. The streamlined Pacifics used for Mercury service did have illuminated drivers. I am skeptical as to whether the streamlined Hudsons did. 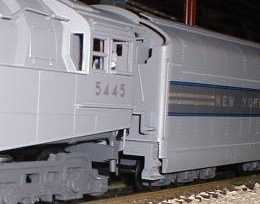 There are six worklights on the Lionel model, whereas the MTH model has four. 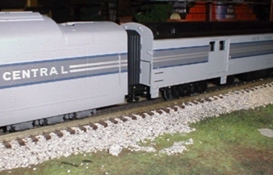 Like the MTH model, the Lionel model looks good with the drivers illuminated. There is a switch under the locomotive to turn the worklights off. 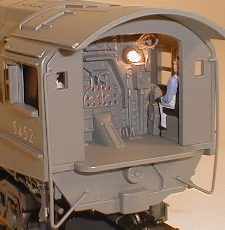 The cab of the Lionel model is very detailed, just a bit more so than the MTH version. In addition to the cab interior light and the six worklights, there is also the firebox glow, headlight, and tender back-up light. The valve gear is not quite as detailed as the older 700E baker valve gear. 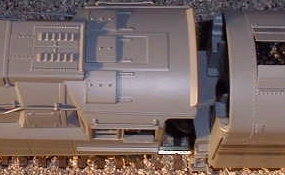 The linkage on the 700E valve gear is a separately applied-detail. On the new Dreyfuss it is a diecast molded part. One nice detail on the boiler casting is the side-view mirrors next to the cabs. Ordinarily, Lionel Hudsons over the past ten years have come with both a scale pilot and the factory-installed 773-type pilot. This model only has a semi-scale pilot but it has extra braking detail on it. Speaking of factory-installed, the Dreyfuss comes with a scale pilot coupler attached to the front. 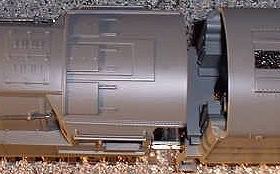 A big tinplate coupler is included and a streamlined panel covering. Most people will probably take off the scale coupler and replace it with the streamlined panel. The streamlined panel has two secure bolts detail where the MTH version does not. Lionel has a molded coal load in the tender where MTH, as always, has a real coal load. Both models have hinged covers over the coal. The tender truck journals are marked for SKF bearings. The MTH model does not have any markings on the journals. The top sides of the two models have some subtle differences. 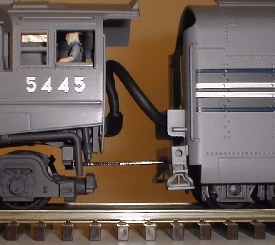 The MTH model has a lip extending up at the end of the cab roof. Pictures of the various real Dreyfuss Hudsons indicate that both are correct. The vents of the two access panels just before the roof are more pronounced on the MTH model. It seems that this locomotive is really designed to run in a TrainMaster Command environment. It is equipped with the Odyssey system which takes a little getting used to, even if you have mastered running trains with the Cab-1 remote. The acceleration of the locomotive is not as gradual as you would expect. You must slowly throttle up with the controller. Once you are running, you may experience a very noticeable change in speed at the slightest turn of the throttle. The Odyssey system is an electronic "cruise control" feature designed to automatically power up or down a locomotive where necessary to maintain a constant speed. This really comes into play when going up or down grades and around curves. To get the full impact of the locomotive's operating potential, it is recommended that you set the stall feature. This is easy to do, and it enables you to smoothly creep the engine. Without setting stall, you may notice some uneven performance from the locomotive at slow speeds. As mentioned in the instructions, throttling up too fast will cause the locomotive to fly off the starting mark, so-to-speak. The instructions suggest that you throttle up just enough to hear a single chuff, then increase power as desired. Smoke comes out in modest puffs. It reminded me of Lionel Postwar steam locomotives because smoke rings hovered in the air. The smoke unit does not appear to be the fan-type. Nevertheless, there is an on/off switch for it under the cab. The RailSounds of this locomotive are as good as ever. The most important aspect of a sound system - the whistle - sounds great. Occasionally, after you release the whistle button, you'll hear a little "toot toot" of the whistle. The TowerCom provides only one line: "New York Central 5452, you are cleared out-bound." One feature of modern RailSounds I never cared for is CrewTalk. CrewTalk is an undecipherable playback of what is supposedly a crew member on the radio. I can't see where having a clear recording of a crewman would take up any more memory on the Liontech chip than the garbled recording does. So why exactly can't the engineer of a train be allowed to understand what is being said over the radio? Is the guy saying "have a nice day" or "derailment up ahead"? Both the Lionel and the MTH model has a prototypical chuffing rate per driver revolution. For a sample of either the MTH or Lionel sounds, click on the appropriate buttons below. Both were recorded with the same equipment, in the same area, under the same conditions. I've never been one to count rivets, and I haven't started with these two models. However, both are missing rivet/bolt detail on the front pilot skirt. There were removable panels on the prototype that covered the air pumps next to the steps. The Smithsonian model has this detail. 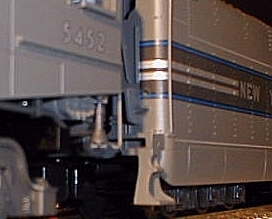 It's surprising that both the MTH and Lionel models overlooked this detail. So it's not a matter of thirteen rivets when there should be fourteen. There's zero. Another problem I have with both models is the lack of operating valve and radius rod. For a detailed explanation of this point, please click here. The Dreyfuss Hudson is my favorite steam locomotive. When MTH and Lionel produced these models, I purchased both of them. As a fan of the prototype, I had expectations of what the models should look like, based in part to what I know both companies are capable of. For the most part, I am satisfied with them. The bottom line on both of them is they are handsome and fun. Upon seeing one of them run, my father said he thought it was the best locomotive I have (he's seen only a fraction of what I own, but in some ways he's right). Both models have their strengths: they both feature the latest in digital control systems and sounds. Both are powerful pullers. But both also could have had certain things done better. Some of the areas I mention above should not add to cost. Perhaps it's nit-picking, but for the money being asked for them, I don't think it's unreasonable.